Over the past three years since we started sharing some of our variant research methodologies, we have arguably been positioned on the profitable side of the tracks far more often than not. Incorporating comparative analysis into our weekly research has helped us proactively guide and temper our respective market expectations. We have found that a combinatorial research approach that takes into account a market's sentiment, positioning and technical framework - can be strengthened by applying comparative studies with similar properties; such as cycle positioning, momentum and price structure. 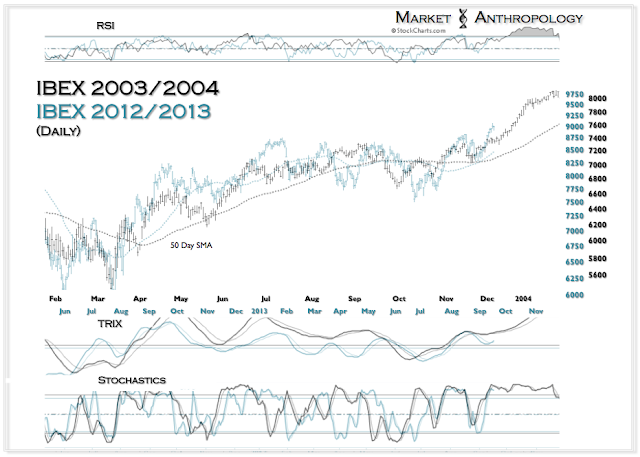 While our opinions to the causality of a certain assets trajectory and potential may be just that - an opinion, the comparative study has often been a first indication that an assets underlying backdrop may be shifting. In essence, it keeps us honest before we really know why. We tend to look at markets as basically open systems with interaction dynamics and kinetics that can and often do change (i.e. interventions and communications by our monetary handlers, reflexive feedback loops, political climates) - but change driven by our inherent social condition that replicates with certain reliable behavioral expressions and geometries. A recent example of a comparative study that kept us on the right side of the market for a very long time, but led us to shift our future expectations basically at the pivot - was the US dollar index this spring. Since April 2011, we were of the opinion that the USDX was carving out an important low and would be trending higher - despite the Fed's active and visible hand with quantitative easing. 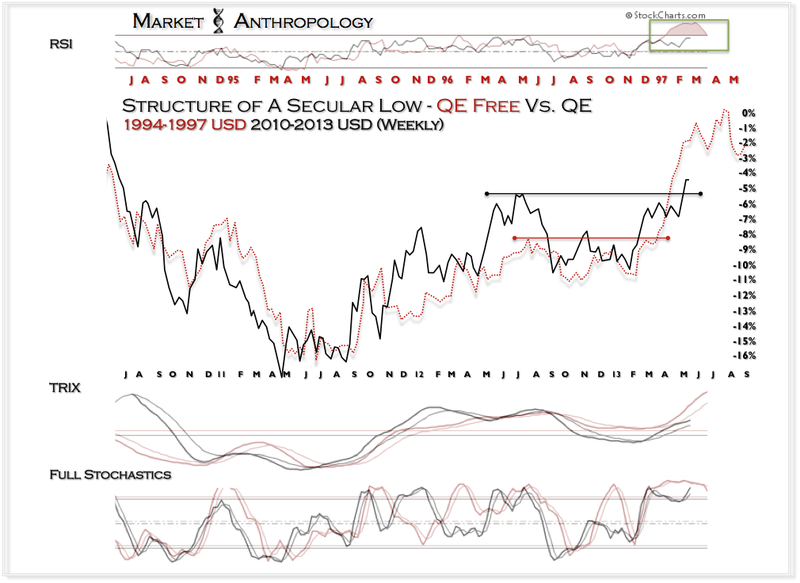 Although several conditions and developments across asset classes helped form this opinion, comparative studies with previous USDX lows greatly buttressed our confidence with our market posture(s). Fast-forward to this May when the USDX was at the top of its range, the 1997 USDX comparative flashed concern that momentum was coming up short and that the dollar was vulnerable to taking another trip lower through the range. 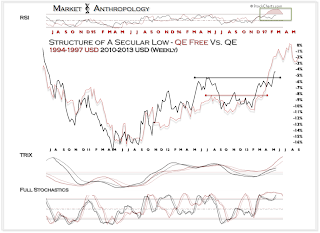 "The most notable divergence today when contrasted with the dollar's last breakout leg during the first half of 1997 - was the considerable strength of the move as shown in its RSI. While the dollar's current momentum profile mimicked the previous cycle's range through April - it has recently diverged over the past month. By the time we closed out May a few days later, the USDX appeared to be taking the exit ramp we had cautioned as we continued to shift our longer-term posture progressively bearish as the negative momentum divergences accumulated. 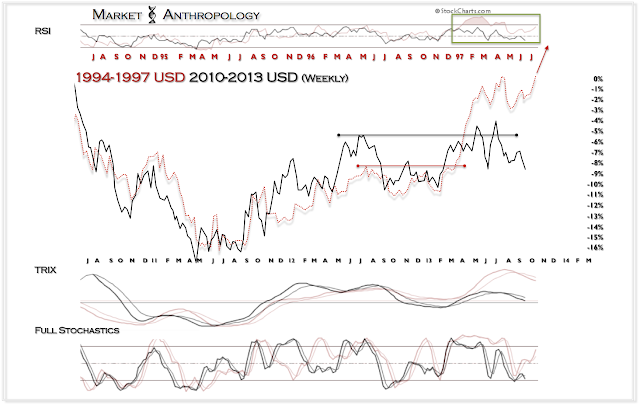 With four months of daylight between our bearish shift in expectations for the USDX, our early concerns with the contrast in momentum of the 97' comparative appears to be justified as price has fittingly taken the mirrored route lower - very much along the lines of the downdraft that began in 1994. 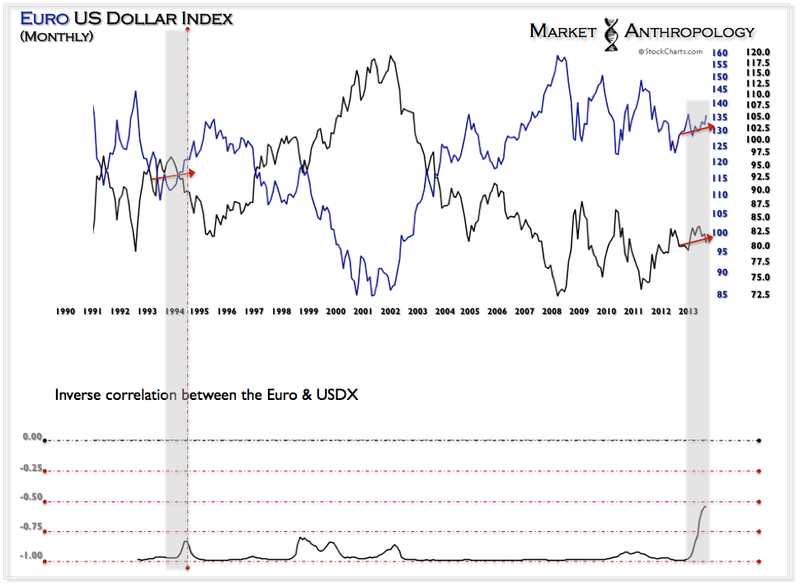 As we have mentioned in previous notes, this year has exhibited the largest and longest correlation drop from the typically strong inverse relationship held between the USDX and the euro. 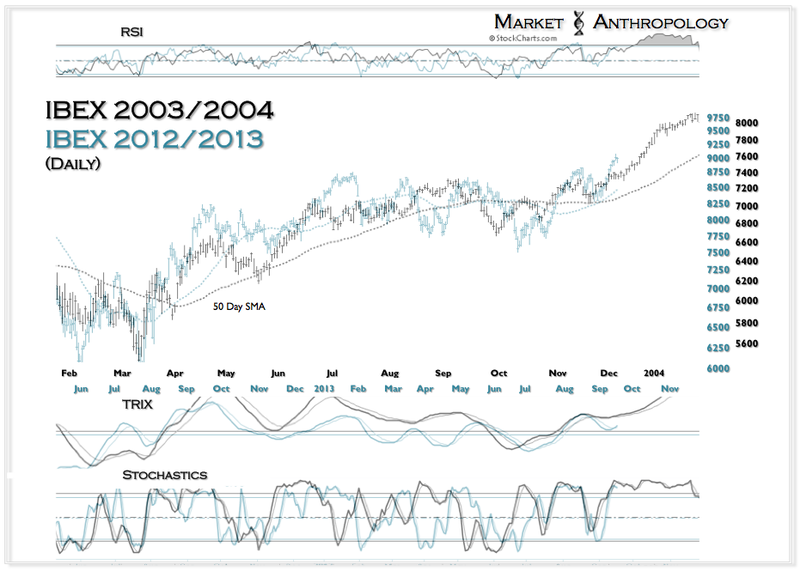 Although the current relationship has trended together far longer than any time in recent history, similar to 1994 - we expect the index to roll-over one final time into 2014 coming out of the correlation extreme. 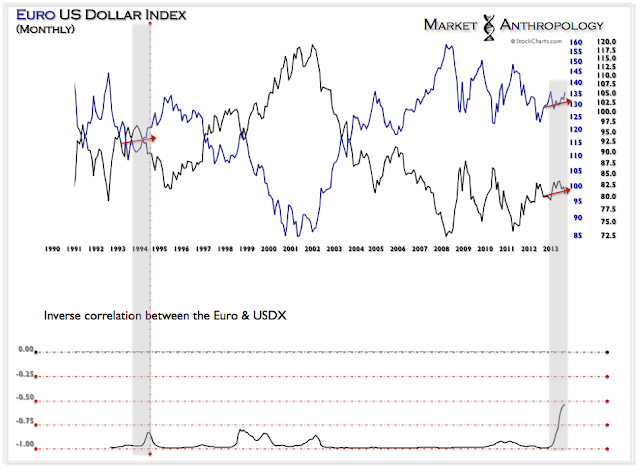 Back in August, we built our confidences out even further that the Euro was winning the tug-of-war of perception with the dollar when it appeared that risk appetites in Europe were setting themselves up to break-out. 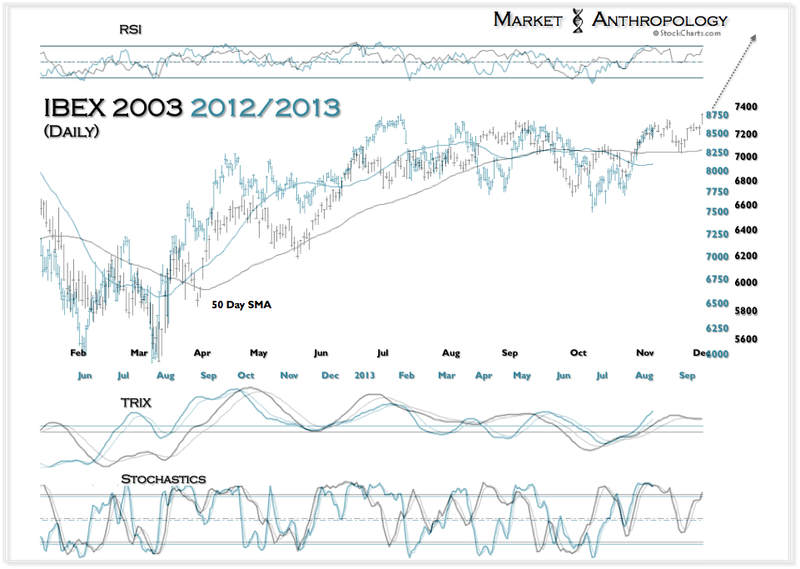 To this point, Spain's IBEX index was highlighted. "Reinforcing the USDX's vulnerability is the surprising strength displayed overseas in Europe, as shown below in Spain's IBEX index which continues to trend away from what appears to be a major low last summer. While we had our doubts last fall that Spain's troubles were behind them - the market has climbed through those concerns, very much along the lines of its previous long-term low in 2002/2003. 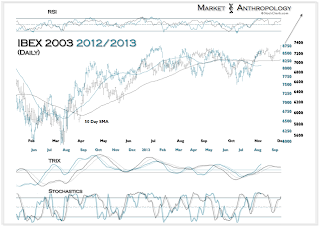 Walking a familiar path, the IBEX made a new high in early August before it once again tested and bounced strongly from its 50 day sma.